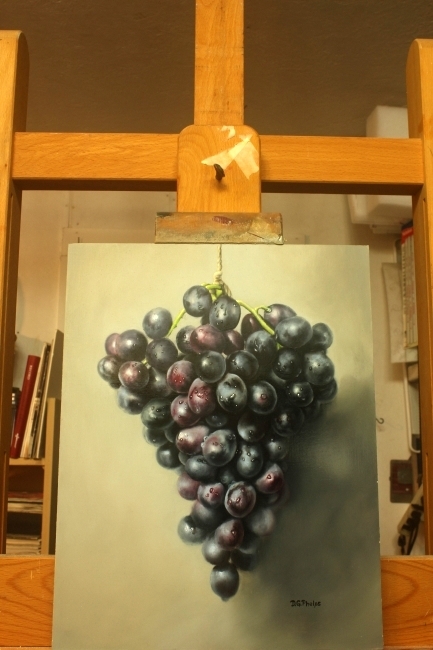 How to photograph art, and eliminate all that glare using Cross Polarization! Photograph art, the right way! Home > Artist Career Practices > Photograph art and eliminate glare. It can be really hard when you're shooting behind glass or a very glossy oil painting. But you can photograph art, and be very successful at it! 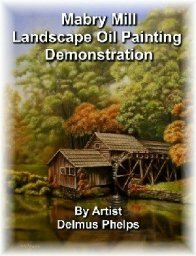 This article will discuss the method I use to photograph my oil paintings, and eliminate ALL glare. It's a technique I was fortunate enough to find in one of the art forums I visit. I decided to give it a try, and well, the rest is history. No more glare! Now, this is a bit complicated in that there are several prerequisites that you need before proceeding. The 2 main items will be polarization filters. The method is called "Cross Polarization". It's the process of aligning all the light rays into a straight shot from the source to your subject and back into your camera. All other directional light sources are eliminated, (which causes glare). I'll get into the details below, but for now, let's understand that the glare creates sparkles, stars and bright spots that eliminate any 'semblance of your true artwork. You just don't want it in the photo. If you a photographing art that is behind glass, it is even worse. 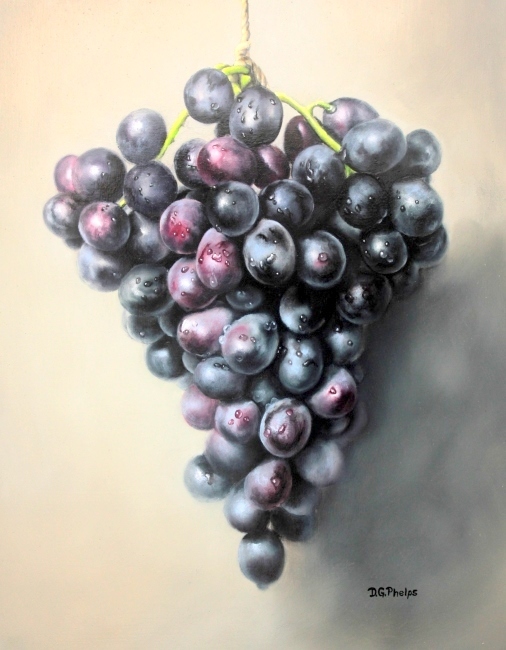 Here's an example of a recent painting I photographed without filters. How a bad photograph of art work looks like. Glare! The glare in the upper right hand side of the painting is what we are talking about. Now, there are many methods to photograph art to try to eliminate these, some work, but none work 100%. 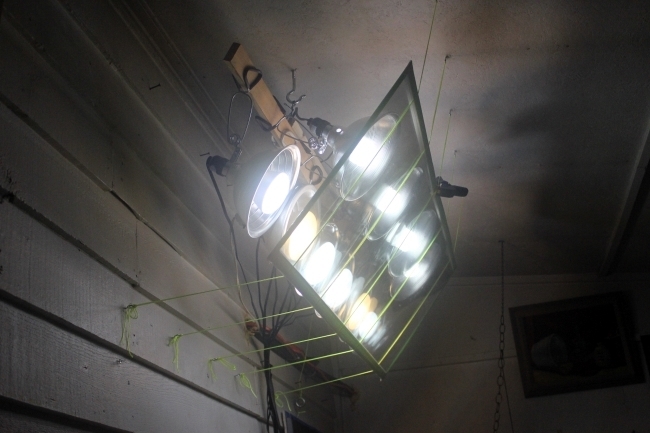 These other methods, moving your lights to less than a 45 degree angle to the work, using screens or softeners over the light, etc., etc., may work, but it's always been a hit and miss for me. I'd take several pictures and then carry my camera up to my office and look really close to the image, and sure enough, somewhere in the picture would be sparkles. Now, let's talk a bit about the drawbacks of using this method. Yes, there are a few, but they can be overcome if you have the right equipment (in a good camera mainly). 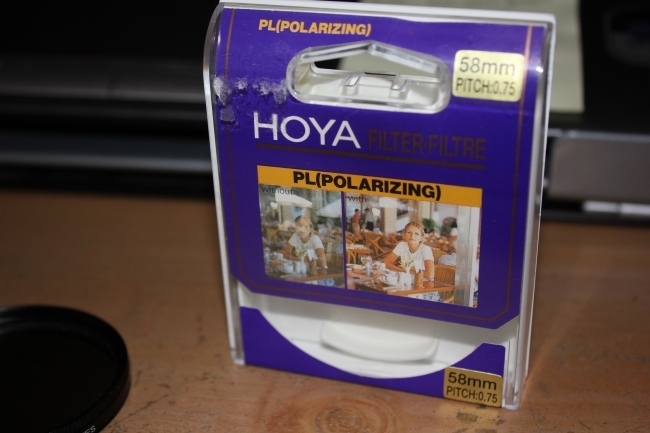 The use of polarizers can alter the color of your art, and will require a long exposure time to the photograph. These are overcome by using a camera that allows for a "custom white balance" and a tripod and self timer/cable release on the camera. That's about the only things I use different with my point and click Canon. (I'm not a photographer, so I like it easy, and the auto settings on this camera are pretty nice). I discuss the "custom white balance" below, and the use of the self timer. Now for the filters. In "Cross Polarization" you are essentially aligning all the light waves coming off of your light source and into your camera are matched to each other and the extra light reflections, glare, hot spots are eliminated. This requires the use of 2 filters. One on the light source to line up the light rays coming off the source, and one on the camera to match those coming from the source. Some of you are familiar with a Circular Polarizer lens that fits on your camera. That helps, but is designed as a stand alone feature to your camera and will not work in this application. 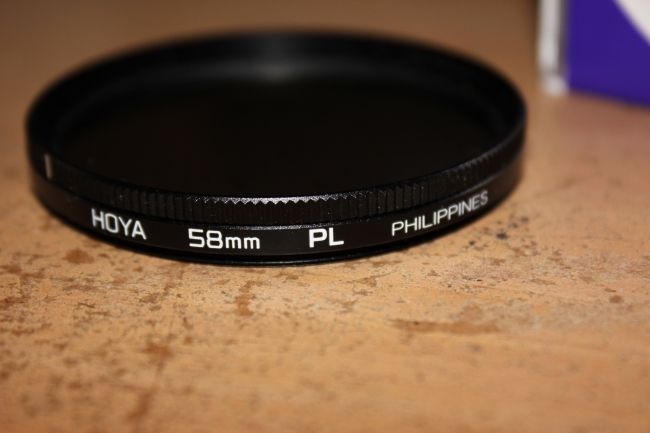 You will need a plain PL or Polarizing Filter. Some call it a linear polarizer. Photograph art with these filters. The second filter is home made using Linear Polarizing Film which can be found here at Polarization.com or do a Google search to find a vendor near you. I use the film by the foot because of a large bank of lights. It comes in a tube, rolled up, and is very flimsy. Some professionals use a filter just over their flash units and/or their light boxes. I have essentially the same thing here, just bigger. When I ordered my film, I bought the educational grade, it was much much cheaper for my purposes. The professional grade is for mass production of sunglasses and such. Using plexiglass to sandwich the film together (obtained from the local hardware store) and some tape to hold the sandwich together. 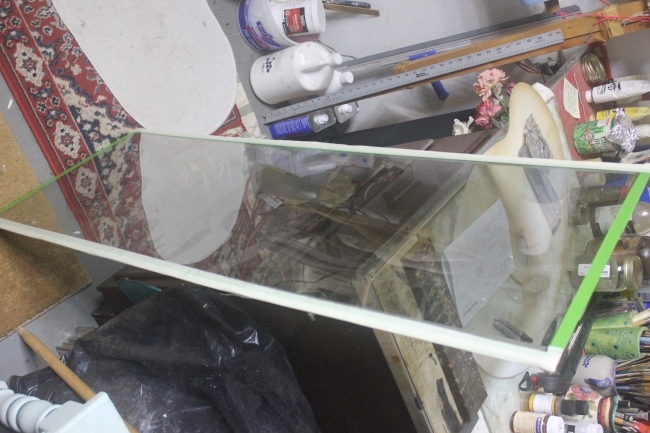 Below is the sandwich of plexiglass and polarization film in the middle. I then hung a bit of twine in front of the bank of lights, and when in use, I slide the film in front of the lamps. When finished, I pull the filter out and store it in the corner of the studio. Here's a picture of the film hanging in it's twine holder. It literally just lays in there, then I have a small clamp that pinches the sandwich to one of the strings. You can see the clamp in the middle of the top edge. Now, here are pictures of before and after. These photos didn't have my custom white balance on so you can see the color shift that took place with the filters. When you photograph art, you also have to square up the image better. I talk about squaring up the image here. 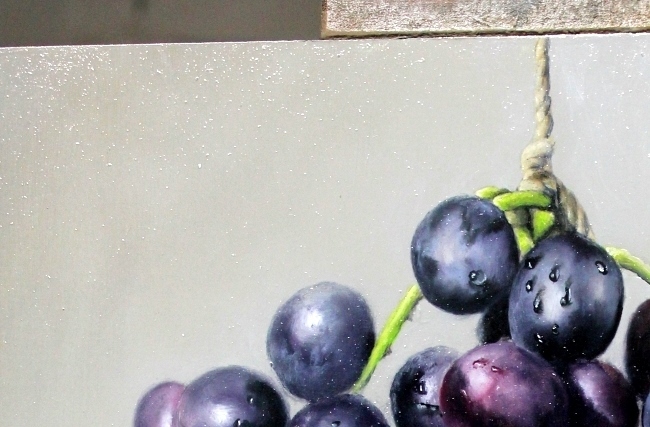 The first photo shows a significant amount of glare and sparkles in the top of the painting. The picture below it shows what happens with a simple twist of the filter on my camera that then lines up the light rays, and the glare just disappears! Photograph art, before and after using filters. In this picture I have used the correct white balance to tell the camera what white really is. Some folks use the RAW setting when they photograph art, but this requires a bit more works on your computer to correct the color balance. I like the easy route and just shoot a big white canvas with the filters on, then tell the camera use this image as it's "custom white balance", and well, you can see the difference for yourself below. Another downside to this technique that is easily remedied is the lack of depth in the photo (which comes from some of the glare on your brush strokes). 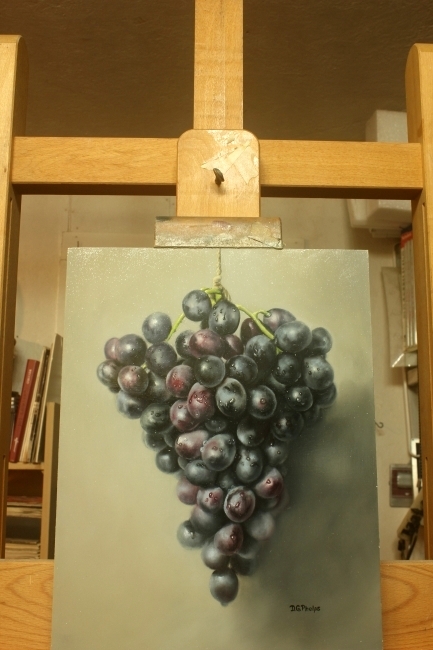 If you paint using impasto passages and lots of built up paint and brush strokes that are visible, simply turn the camera filter slightly to let some of the reflections on those brush strokes come on through. Since my paintings are virtually smooth except from some of the highlighted areas, it's not an issue for me. Now for my camera settings. I use a tripod that is at least 6 to 8 feet away from my painting. The tripod must be used because the filter dims the light source so much. Since I shoot using the JPEG rather then the RAW setting, I have to use a "color balance or picture style" setting. This is different than white balance. For my Canon, its the "Faithful" setting. On Nikon it may be a different setting. Since my camera doesn't have a mechanical cable release I use the self timer at 2 seconds to snap the picture. This allows for no movement from my hand when I depress the shutter (which is on a tripod). The next settings are for the exposure. I set the ISO to the lowest number available. I set the APERTURE to 3 clicks above the lowest f-number. The shutter speed is set to get the correct brightness, and this I will "bracket" shooting several below and above what appears to be a correct setting through my view finder. Click here to head back to the top of our photograph art article. If you want to watch the actual effect take place on a recent painting that I have varnished and has a super glossy surface, just click below!